Just to let you know that I’ve updated all the postcodes and wards at api.flocktogether.org.uk to the latest versions. Postcode & geo look-up of ward, constituency, council etc. Just to let you know that the Flock Together API now lets you quickly and easily add wards and other geographical data to the party’s Salesforce membership reports. You can do the upload at http://api.flocktogether.org.uk/addareatodata.php. The Lib Dem Account system seems to have stopped working – so we’ve switched it off. You may need to reset your password here. After 4½ sterling years of service, LibDig is no more. Here on FlockTogether, we supported LibDig from the beginning and we’re sorry to see it go! I’ve updated the LibDig WordPress plug-in to tell people about the change and suggest they deactivate it! 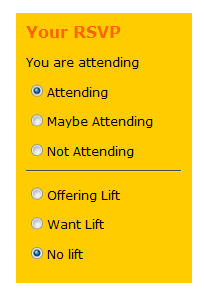 Just to let you know that individual contact details for events now stop displaying 30 days after an event has happened. The federal party has some campaign days coming up. You can read more details on the ALDC website here. 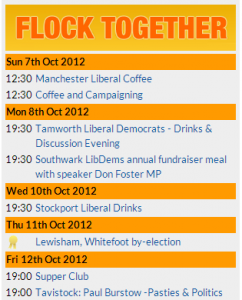 A bit thank you to Lib Dem Voice for showing the latest Flock Together events on their blog. And a big thank you to Ryan Cullen for making it possible. It’s the first use of the new JSON feed I referred to in the last blog post. Twitter announced their follow button earlier today. Just so you don’t feel left out, it’s now installed on FlockTogether. Inspired by the example of 38degrees (who know a thing or two about these things), I’ve just signed up Flock Together to the excellent-looking uservoice system. Click on the ‘Feedback’ tab to the left, or go directly to the Uservoice site to have your say about how Flock Together can improve and I’ll do my best (in my free time) to implement the suggested changes. 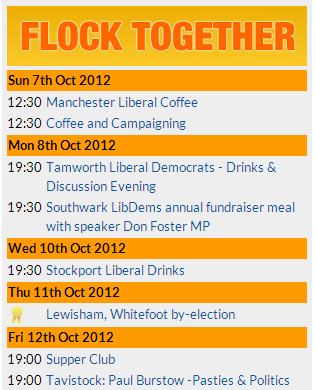 Flock Together now also pulls any by-elections that it doesn’t already have semi-automatically off the ALDC website. It doesn’t show them all – just the ones with contact details – but it should help keep Flock Together more easily up to date.